Unusually for a woman of the 18th century, Cecilia is wealthy in her own right, with (as we learn early on) £10,000 free and clear from her parents and an estate from an uncle that assures her an additional yearly income of £3,000. She is also beautiful, kind and intelligent. And an orphan! Random fact that will turn out to be important is an odd condition of her uncle’s will: any man she marries must take her name and drop his own. Otherwise she will forfeit the yearly £3,000. “Cecilia” begins with a painful slowness. (What I am saying? Despite being crowded with incident, it continues with a painful slowness. For more than 1,000 pages!) It starts with Cecilia a little short of her majority, losing her uncle and leaving Suffolk, where she had grown up, for London. Her uncle has left her in the care of three guardians: the husband of her best friend from childhood (for affection); a shrewd businessman in the city (who is supposed to safeguard her fortune) and a well-connected aristocrat (who is supposed to look after her in a social sense). All prove disastrous. The businessman is a mad miser, the aristocrat a hopeless snob, and the friend’s husband a spendthrift and a gambler, who manages to lose all his own money and coerce Cecilia into lending him, bit by bit, her entire unencumbered £10,000 before, driven to despair by his debts, he shoots himself. The early part of “Ceclilia” is like one of Hogarth’s progresses, turned into a novel: full of “types,” dramatic incident and broad satire of 18-century society. Cecilia’s wealth and beauty has made her irresistible on the marriage market, and a wide variety of gentlemen are lining up to give it their best shot. Being possessed of high standards and considerable discernment, though, she is isn’t too impressed by what’s on offer. 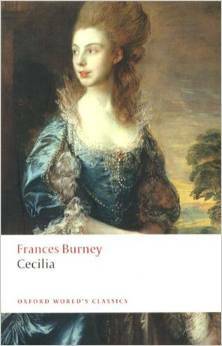 In some ways, “Cecilia” expands on Burney’s first novel, “Evelina,” in that both explore the unenviable condition of being female in 18th-century England. Evelina is beautiful but penniless and seemingly unprotected, and thus subject to all kinds of insult and sexual predation. Cecilia is insulated from the kinds of indignities Evelina faced — but her problems are only different, not less. That Cecilia must choose one of these men and find love (or die trying, like her unfortunate fictional counterpart Clarissa Harlowe) is clear from the logic of its being an 18th-century novel, and part of the fun at the start is trying to figure out who, in the crowded cast of wooers, is going to distinguish himself, and how. When she meets a kind and witty, yet mysterious, young gentlemen at masked ball dressed as a white domino who rescues her from social distress, I felt premonitory shivers of Georgette Heyer, Dorothy Sayers and a thousand Harlequin romances. Domino is clearly either “the one” or the worst thing that will ever happen to Cecilia. As it turns out, it’s kind of both, for Mortimer Delvile (Yes! Fanny Burney named her romantic hero Mortimer! ), it emerges, is the only son of Cecilia’s third guardian, the snob. No one of Cecilia’s relatively obscure parentage, however rich, could possibly be good enough for his son, even without the dire prospect of the exalted name of Delvile disappearing forever. Never mind that Mrs. Delvile, who unlike her husband is kind and good (though also beset by pride in being a Delvile, being not only one by marriage but also her husband’s cousin) loves and admires Cecilia for her kindness and intelligence. She can’t imagine the marriage either. Thus the entire middle third of the book revolves around the improbable problem that two people who love each other cannot marry because he cannot possibly take her name. That, and many willful or coincidental misunderstandings by Cecilia and Mortimer about the nature of their feelings for each other. And lots and lots of dramatic speeches. What’s missing? Any semblance of reality, and any sense of the physical. Mortimer is sweet, and he’s funny — kind of an ur-Henry Tilney, except he picks a girl just as clever as he is. But he does not seem to exist as a physical being, any more than Cecilia does. They are all mind. This may be part of why Austen’s characters seem so much more plausible, less like the personifications of ideas. Why Elizabeth Bennett never seem a victim of circumstances the way Cecilia, though richer, more virtuous and arguably smarter, often does. To say that Jane Austen was a genius, while Fanny Burney was a clever woman who wrote amusing novels, gets us only part of the way there. Another mystery is why I enjoyed this book so much all the while I was finding it utterly ridiculous. Do I weigh old books on a different balance than contemporary fiction? I probably do, but that’s also a problem for another day. Next > I No Longer Write Like Jane Austen! I have had that happen while trying to comment on Wordprss blogs, and it’s really irritating. Glad to know I am not the only one, and thanks for stopping by. I vaguely recall having read Evelina many years ago out of curiousity. Given the number of novels written in the period very few are available to the general reader. Austin’s prose has a clarity and directness which is more acceptable to modern readers compared to many of her contemporaries. The thought of a 1000 pages is a bit offputting, I firmly believe that brevity is the soul of wit. So true. If you’ve read “Evelina” you’ve gotten the Fanny Burney flavor. I mainly read wanting it to read stuff Jane Austen would have been influenced by. And as I said, it wasn’t a terrible read at all. Just kind of … hmmm. “Clarissa,” though. THAT is worth reading.